Organic farming is defined as a production system which works with localized conditions to create products that integrate biological, cultural, and mechanical practices which promote biodiversity. There are several required components which must be included with the farming process for the crops generated to be labeled as organic. Biological controls must be used, including crop rotation and disease management, instead of chemical controls. The agricultural system must have an emphasis on biodiversity placed on the surrounding environment. Organic farming must also reduce off-farm inputs and external inputs that may affect the growing process. Renewable resources must be used in some way as well, while synthetic fertilizers musts be completely eliminated. When done properly, organic farming is able to maintain the balance of an ecosystem. It uses nature as the model to produce needed items. There are certain advantages and disadvantages of organic farming which must be considered. 1. It creates higher natural levels of resistance to pests and disease. Organic farming eliminates the use of synthetic products to maximize the yields that can be produced. It works on creating a healthier soil instead, encouraging the link between healthy plants and protected soils. No chemical herbicides or pesticides are used. Only natural soil enhancement techniques are permitted. Healthy plants, grown in health soil, are naturally resistant to disease and pests. These plants have stronger natural defense mechanisms through this technique, which thickens the cell walls of the plants being grown. 2. Organic farming allows for specialization opportunities. Conventional farming practices focus on the growth of a specific commodity crop. In the United States, that means soybeans, wheat, or corn are typically grown. Through organic farming practices, there are more opportunities to specialize. That is because the farm produces crops that grow best in the soil composition that is available to the farmer. The advantage of being able to grow a specialty crop is that these produces usually command a higher price at the market. Organic foods can already be priced about 20% above commodity crops. Specialization can add another 20% to 40% to the final price a customer pays. Many organic farmers can sell directly to their customer base as well, which eliminates the costs that other farmers often pay. 3. This farming process supports a healthier soil and supports pollinators. One of the biggest risks to bees and other pollinators is a synthetic agricultural chemical application. Glyphosate and neonicotinoids are particularly devastating on certain pollinator populations. At the same time, soils from organic farms are known to produce items that have higher antioxidant content, Vitamin E, and omega-3 fatty acids when consistent practices are used. There are higher micronutrient and mineral levels in produced food products through organic farming because organic materials reach into deeper soil layers. 4. There are no worries about genetically modified foods with organic farms. Organic farming does not use GMO crops at all. Farmers are permitted to cross-breed plants (or animals) to encourage better natural production levels. They are not permitted to use industry-altered products when growing or producing items for the market. This requirement may limit the yields that a farm is able to produce when compared to GMO farming, but it also eliminates the threat of customers leaving because they don’t want to consume GMO products. 5. The working environment for organic farmers is healthier. Farmers who are involved in the organic farming process are not exposed to potentially dangerous synthetic ingredients as they manage their fields on a daily basis. People who are consistently exposed to chemical pesticides have a higher risk of developing a future neurological disease. Higher levels of lifetime exposure will increase this risk. Many farmers who use synthetic products will suffer from a myriad of bothersome symptoms over time. Headaches become quite common, including migraine headaches. Fatigue is another common complaint. Increased exposure may also lead to memory loss in some individuals. 6. Organic farmers can often create their own fertilizers at their farming location. Soil fertility is improved with organic farming methods because natural fertilizers must be used to prepare fields. Several methods are possible, including crop rotation that uses certain fields for pasturelands, for up to 6 years between growing crops. Green manure, worm farming, composting, and cover crops are all effective methods of creating needed fertilizers as well. 7. It can be implemented in almost any geographic location or growing season. The processes of organic farming store carbon within our soil. It reduces energy requirements. It limits the need for products based on fossil fuels. No matter how long a growing season may be, organic farming efforts can be implemented to maximize the natural production levels that are available. 1. There are no subsidies offered for most organic farmers. Most industrialized countries offer farm subsidies of some type to encourage people to become farmers. Without farmers, it would be difficult to have our food and fuel demands met, after all. Unfortunately, most of the subsidies that are authorized only apply to farmers that are growing commodity products. Without access to subsidies, organic farmers take on many more risks that could wipe them out, such as weather changes or a crop failure. 2. It requires more work to produce goods that are ready for sale. Organic farming may still allow for certain “organic” fungicides or pesticides, which can reduce the work burden for some. For the average farmer, however, there is a greater physical burden that applies to the production of crops for the marketplace. Pulling weeds and other cultivation techniques must be used frequently. New ideas in permaculture and biodynamics are changing this negative component of organic farming over time. Compared to commodity farming, there are still many additional labor requirements in organic farming that must be considered. 3. Organic farmers must have specific knowledge about localized growing systems. The quality of a crop that can be produced through organic farming is heavily reliant on the skills, knowledge, and wisdom of the individual farmer. In organic farming, the farmer must monitor crop growth patterns during every critical stage of growth. If a farmer is unable to recognize a problem that may be present, then the value of the crop may be reduced. In extreme circumstances, crop loss may even occur for some farmers. At the same time, farmers must also have local knowledge about soil systems, ecology, meteorology, and other influential factors that can affect how certain crops grow. 4. There are unique marketing challenges in place for organic goods. Organic foods are more expensive than commodity foods or commercially-grown products. The marketplace for organic foods is not as defined as it is for other crops either. That can make it difficult for specialty farmers to compete with their own products. To counter this issue, many communities are developing food cooperatives with local farmers and markets. For a small fee, customers can “prepay” for organic foods that they can pick-up after the growing season has been completed. 5. Organic farms and foods must go through a rigorous certification process. In the United States, organic certifying agents that are accredited by the USDA must certify the farms before an organic label can be associated with the crops and products produced. Farms or product processors which create less than $5,000 in gross income from organic sales are exempt from this standard. Otherwise, it is illegal to market a product as being organic. For many organic farms, that means the organic certifying agent must be hired to verify that the farming methods meet the current organic standards that have been authorized. The total cost of the initial authorization can be as high as $1,500. There are also annual certification fees that must be paid. The annual certification fees are based on a farm’s total organic production value, which means some farmers may pay the $1,500 fee every year. 6. It usually costs more to be competitive with organic farming. Outside of the certification costs that are required to begin organic farming in the first place, there are a number of additional start-up costs that must also be considered. Certain soil amendments, such as rock dust, are more expensive for many farmers when compared to the traditional chemicals that may be used in commodity farming. As soil conditions improve through organic farming processes, the costs in this category usually decline over time. Many organic farmers can maintain healthy soils through composting and other natural methods. That is not a guarantee, however, so some organic farmers may never see cost-savings develop over time compared to neighboring commodity farmers. 7. There are different levels of “organic” permitted in the United States. There are 4 different levels of organic foods that are permitted in the United States. An item is labeled as 100% organic only if it is produced through a certified process. For a multi-ingredient product, all items must be grown through a certified organic process, although water and salt are excluded. There is a 95% requirement in place for a food to be labeled as “organic.” That means 5% of the ingredients can be non-organic. In the U.S., there is an approved list of additional ingredients that must be used. “Made with organic” labels follow the same requirements, allowing 30% of the ingredients to be non-organic. In the U.S., products in this category are not permitted to use the USDA organic seal. If more than 30% of a product is made from non-organic ingredients, then it cannot be labeled as an “organic” product in any way. It can, however, list specific organic ingredients on its product label. 8. Synthetic chemicals can still be used in organic farming. In the United States, organic foods are typically free of synthetic pesticides. There are, however, some exceptions to the rule. Organic farmers who can provide that natural pesticides have not worked to control pests are permitted to use synthetic products under specific circumstances. These farmers must show that cultural management practices and other organic practices have failed repetitively. 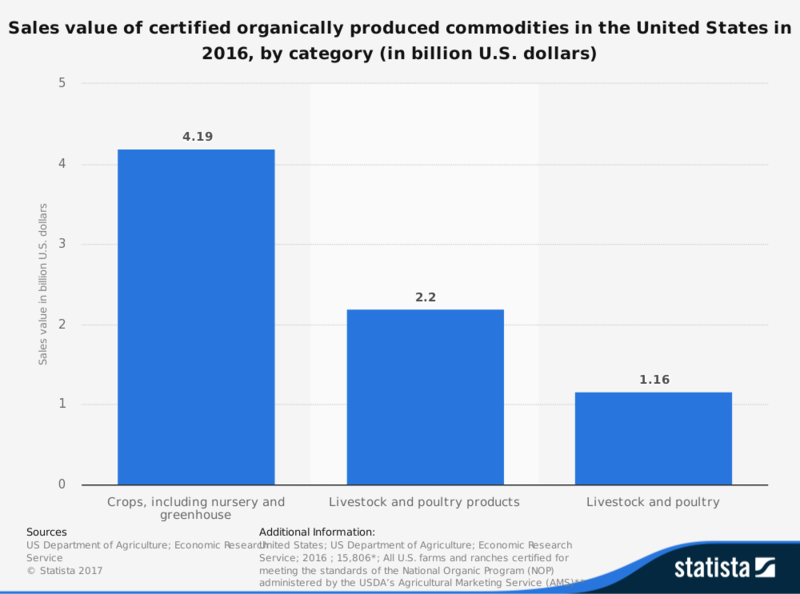 That means some organic foods being sold are exposed to the same chemicals and processes that commodity and conventional crops have – but with the higher organic prices. For some, that means there is no difference between the different products that are available in local markets. 9. Organic crops generally spoil faster. Conventional foods are treated with waxes or preservatives to maintain their freshness during the shipping process. Organic foods cannot receive the same treatments. For many products, that means organic versions will spoil faster than conventional versions. If product arrivals are delayed or mishandled for some reason, then an entire shipment or crop may never make it to the market for consumption. I recommend that you read these 19 important organic food consumption statistics that support some of these pros and cons. The advantages and disadvantages of organic farming involve cost, production labor, and market size. All three factors must be present for a farmer to create profits from their organic methods. Without subsidies, there will always be a measure of risk involved as well. With foods that are tastier, potentially healthier, and without artificial chemicals produced, however, organic farming is also a process that everyone can feel good about.